Ghahremani, Hooman, Hashemi, Niloofar. (1397). A Critical Approach to the Interventions in Historical Urban Fabrics Focusing on City Competitiveness; Case Study: Central Area Surrounding the Holy Shrine, Mashhad, Iran. معماری و شهرسازی آرمان شهر, 11(22), 51-68. Hooman Ghahremani; Niloofar Hashemi. "A Critical Approach to the Interventions in Historical Urban Fabrics Focusing on City Competitiveness; Case Study: Central Area Surrounding the Holy Shrine, Mashhad, Iran". معماری و شهرسازی آرمان شهر, 11, 22, 1397, 51-68. Ghahremani, Hooman, Hashemi, Niloofar. (1397). 'A Critical Approach to the Interventions in Historical Urban Fabrics Focusing on City Competitiveness; Case Study: Central Area Surrounding the Holy Shrine, Mashhad, Iran', معماری و شهرسازی آرمان شهر, 11(22), pp. 51-68. Ghahremani, Hooman, Hashemi, Niloofar. A Critical Approach to the Interventions in Historical Urban Fabrics Focusing on City Competitiveness; Case Study: Central Area Surrounding the Holy Shrine, Mashhad, Iran. معماری و شهرسازی آرمان شهر, 1397; 11(22): 51-68. 1Assistant Professor of Urban Design, Faculty of Architecture and Urbanism, Ferdowsi University of Mashhad,Mashhad, Iran. 2M.A. of Urban Design, Faculty of Architecture and Urbanism, Ferdowsi University of Mashhad, Mashhad, Iran. 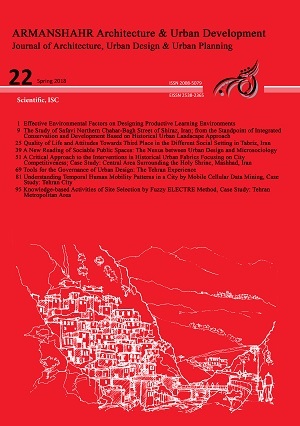 This paper reviews one of the main controversies in public policy, the concept of city competitiveness and how it responds to the issue of urban decline, accentuating the contribution of urban regeneration to competitiveness of cities through theoretical and case study review (Mashhad’s central historical urban fabrics). Following a review of four main urban regeneration themes within the conditions of competitiveness, a classification of the key considerations to each theme is presented in three comprehensive dimensions. Furthermore, urban interventions in historical contexts is the issue explored in Mashhad, a city envisioned to become the cultural-religious center within the Islamic world. The research seeks to explore whether the physical-spatial interventions in Mashhad’s central fabrics (considering the local existing potentials) have paved the way to the vision of a cultural-religious competitive city in the Islamic world or not. For this purpose, interventions through the city’s central historical urban fabrics within the last few decades are explored in an analytic-adaptive comparison with urban regeneration’s key considerations. It is finally revealed that urban decision-makers’ simplistic understanding towards urban competitiveness besides specialists’ negligence of the city’s local context as a competitive advantage and the conversion of pilgrimage culture to pilgrimage industry has led to a top-down bulldozing authoritative approach that not only sacrifices “socio-spatial values” for “commercial values” but also makes a distance between people and their living environment in the long run. It is highlighted that offering appropriate and possible regenerative strategies for the realization of suitable urban spaces should vary based upon given contextual capabilities and talents of each part of the city which may not be equally feasible in different cities. Alexander, Ch. (2002). The Nature of Order: An Essay on the Art of Building and the Nature of the Universe.Book One, the Phenomenon of Life. Berkeley, Calif, Center for Environmental Structure. Annoni, P., & Dijkstra, L. (2013). EU Regional Competitiveness Index (RCI 2013), Luxembourg: Publications Office of the European Union. Architecture and Urban Planning Supreme Council (2017). The Resolution of Architecture and Urban Planning Supreme Council for Areas Surrounding the Holy Shrine of Imam Reza, Enacted in October 11th. Ashworth, G.J. & Voogd, H. (1990). Selling the City: Marketing Approaches in Public Sector Urban Planning.London: Belhaven Press. Ashworth, G.J. & Voogd, H. (1994). Marketing and Place Promotion. In J.R. Gold & Ward, S.V. (Eds), Place Promotion: The Use of Publicity and Marketing to Sell Towns and Regions, Chichester: John Wiley & Sons. Bahrainy, H., Izadi, M.S., & Mofidi, M. (2014). Urban Renewal Approaches and Policies (from Reconstruction to Sustainable Urban Regeneration), Urban Studies, 2, 17-30. Balkyte, A., & Tvaronavičiene, M. (2010). Perception of Competitiveness in the Context of Sustainable Development: Facets of Sustainable Competitiveness, Journal of Business Economics and Management, 11(2), 341-36. Balsas, C. (2004). City Centre Regeneration in the Context of the 2001 European Capital of Culture in Porto. Journal of Local Economy, Portugal, 19(4), 396–410. Beriatos, E., & Gospodini, A. (2004). Glocalising Urban Landscapes: Athens and the 2004 Olympics. Cities, 21(3), 187–202. Beswick, C.A., & Tsenkova, S. (2002). Overview of Urban Regeneration Policies in Urban Regeneration: Learning from the British Experience. (Tsenkova, S., Ed. ), University of Calgary. Carmona, M., Heath, T., Oc, T., & Tiesdell, S. (2003). Public Places, Urban spaces: The Dimensions of Urban Design. Oxford: Architectural Press. Castells, M. (1996). The Information Age: Economy, Society, and Culture. The Rise of the Network Society, Blackwell, Oxford. Castells, M. (1999). Information Technology, Globalization and Social Development. UNRISD Discussion, 114. Evans, G. (2003). Hard Branding the Cultural City: From Prado to Prada. International Journal of Urban and Regional Research, 27(2), 417- 440. Florida, R. (2002). The Rise of Creative Class: And How It is Transforming Work, Leisure, Community and Every Day Life. Basic Books, New York, NY. Garcia, B. (2004). Cultural Policy and Urban Regeneration in Western European Cities: Lessons from Experience, Prospects for the Future. Local Economy, 19(4), 312–326. Gospodini, A. (2002). European Cities in Competition and the New ‘Uses’ of Urban Design, Journal of Urban Design, 7(1), 59–73. Hassan, S. (2000). Determinants of Market Competitiveness in an Environmentally Sustainable Tourism Industry. Journal of Travel Research, 38(3), 239-245. Hubbard, P., & Hall, T. (1998). The Entrepreneurial City: Geographies of Politics, Regime and Representation. Chichester: John Wiley & Sons. Huggins, R. (2003). Creating a UK Competitiveness Index: Regional and Local Benchmarking, Regional Studies, 37(1), 89-96, London, Routledge. Judd, D.R., & Swanstrom, J. (1998). City Politics: Private Power and Public Policy. Longman, New York. Kavaratzis, M. (2004). From City Marketing to City Branding: Towards a Theoretical Framework for Developing City Brands. Journal of Place Branding, 1(1), 58–73. Kong, L. (2000). Culture, Economy, Policy: Trends and Developments. Geoforum, Special Issue on Culture Industries and Cultural Policy. 31(4), 385- 390. Kresl, P.K. (1995). The Determinants of Urban Competitiveness: A Survey. North American Cities and the Global Economy, 45- 68. Thousand Oaks, CA: Sage Publications. Kreukels, A.M.J., & Salet, W.G.M. (1992). Debating Institutions and Cities. Proceedings of the Anglo-dutch Conference on Urban Regeneration, Preliminary and Background Studies, 76. Landry, C., Greene, L., Matarasso, F., & Bianchini, F. (1996). The Art of Regeneration: Urban Renewal through Cultural Activity, London, Da Costa Print. Madanipour, A. (1996). Design of Urban Space: An Inquiry in to a Socio-spatial Process. (F. Mortezaei, Trans.). Tehran, Processing and Urban Planning Corporation. McCarthy, J. (2006). The Application of Policy for Cultural Clustering: Current Practice in Scotland, European Planning Studies, 14(3). McNeill, D., & While, A. (2001). The New Urban Economies. Handbook of Urban Studies. London, Sage. Mehrazan Consultants. (2016). Strategic Program for Leadership of Harmonious Development in Areas Surrounding the Holy Shrine, Tehran-Mashhad, Iran. Miles, S., & Paddison, R. (2005). Introduction: The Rise and Rise of Culture-led Urban Regeneration, Urban Studies, 42(5-6), 833–839. Paddison, R. (1993). City Marketing, Image Reconstruction and Urban Regeneration, Journal of Urban Studies, 30(2), 339-350. Pine, B. J., & Gilmore, J. (1998). Welcome to the Experience Economy, Harvard Business Review, 97- 105. Rezvani, A. (2005). In Search of Urban Identity, Mashhad. Ministry of Housing and Urban Development, Tehran. Roberts, P., & Skyes, H. (2000). The Evolution, Definition and Purpose of Urban Regeneration. Urban Regeneration a Handbook, London, Sage, 9-36. Schwab, K. (2009). The Global Competitiveness Report. Geneva: World Economic Forum, 492 [cited 17 March 2010]. Available from Internet: <http://www.weforum.org/pdf/GCR09/ GCR20092010fullreport.pdf>. ISBN-13: 978-92-95044-25–8. Singhal, S., Berry, J., & McGreal, S. (2009). A Framework for Assessing Regeneration, Business Strategies and Urban Competitiveness, Local Economy, 24(2), 111–124. Spaans, M. (2004). The Implementation of Urban Regeneration Projects in Europe: Global Ambitions, Local Matters, Journal of Urban Design, 9(3), 335-349. TASH Consultants (2006). The Renovation and Rehabilitation Plan for the Fabrics Adjacent to the Holy Shrine of Imam Reza, Urban Design Basic Studies, First Edition. UN-habitat. (2013). The Competitiveness of Cities.The Global Urban Economic Dialogue Series, Nairobi: UN-habitat. URBACT II (2015). New Urban Economies. Saint Denis, URBACT. Yelinek, A. (2009). Culture as a Tool for Urban Regeneration. The Jerusalim Institute for Israel Studies, 1-33.